"Mars I" redirects here. For the Soviet Mars probe, see Mars 1. For other uses, see Mars 1 (disambiguation). Phobos (/ˈfoʊbəs/ FOH-bəs, /-bɒs/ -⁠boss, from Greek Φόβος'; systematic designation: Mars I) is the innermost and larger of the two natural satellites of Mars, the other being Deimos. Both moons were discovered in 1877 by American astronomer Asaph Hall. Phobos is a small, irregularly shaped object with a mean radius of 11 km (7 mi) and is seven times as massive as the outer moon, Deimos. Phobos is named after the Greek god Phobos, a son of Ares (Mars) and Aphrodite (Venus) and the personification of fear (cf. phobia). Phobos orbits 6,000 km (3,700 mi) from the Martian surface, closer to its primary body than any other known planetary moon. It is so close that it orbits Mars much faster than Mars rotates, and completes an orbit in just 7 hours and 39 minutes. As a result, from the surface of Mars it appears to rise in the west, move across the sky in 4 hours and 15 minutes or less, and set in the east, twice each Martian day. Phobos is one of the least reflective bodies in the Solar System, with an albedo of just 0.071. Surface temperatures range from about −4 °C (25 °F) on the sunlit side to −112 °C (−170 °F) on the shadowed side. The defining surface feature is the large impact crater, Stickney, which takes up a substantial proportion of the moon's surface. In November 2018, astronomers concluded that the many grooves on Phobos were caused by boulders ejected from the asteroid impact that created Stickney crater that rolled around on the surface of the moon. Images and models indicate that Phobos may be a rubble pile held together by a thin crust, and that it is being torn apart by tidal interactions. Phobos gets closer to Mars by about 2 meters every one hundred years, and it is predicted that within 30 to 50 million years it will either collide with the planet, or break up into a planetary ring. Phobos was discovered by astronomer Asaph Hall on 18 August 1877, at the United States Naval Observatory in Washington, D.C., at about 09:14 Greenwich Mean Time (contemporary sources, using the pre-1925 astronomical convention that began the day at noon, give the time of discovery as 17 August at 16:06 Washington mean time). Hall had discovered Deimos, Mars's other moon, a few days earlier on 12 August 1877 at about 07:48 UTC. The names, originally spelled Phobus and Deimus respectively, were suggested by Henry Madan (1838–1901), Science Master of Eton, based on Greek mythology, in which Phobos is a companion to the god Ares. Phobos has dimensions of 27 km × 22 km × 18 km, and retains too little mass to be rounded under its own gravity. Phobos does not have an atmosphere due to its low mass and low gravity. It is one of the least reflective bodies in the Solar System, with an albedo of about 0.071. Infrared spectra show that it has carbon-rich material found in carbonaceous chondrites. Instead, its composition shows similarities to that of Mars’ surface. Phobos's density is too low to be solid rock, and it is known to have significant porosity. These results led to the suggestion that Phobos might contain a substantial reservoir of ice. Spectral observations indicate that the surface regolith layer lacks hydration, but ice below the regolith is not ruled out. Phobos is heavily cratered. The most prominent of these is the crater, Stickney, (named after Asaph Hall's wife, Angeline Stickney Hall, Stickney being her maiden name) a large impact crater some 9 km (5.6 mi) in diameter, taking up a substantial proportion of the moon's surface area. As with Mimas's crater Herschel, the impact that created Stickney must have nearly shattered Phobos. Many grooves and streaks also cover the oddly shaped surface. The grooves are typically less than 30 meters (98 ft) deep, 100 to 200 meters (330 to 660 ft) wide, and up to 20 kilometers (12 mi) in length, and were originally assumed to have been the result of the same impact that created Stickney. Analysis of results from the Mars Express spacecraft, however, revealed that the grooves are not in fact radial to Stickney, but are centered on the leading apex of Phobos in its orbit (which is not far from Stickney). Researchers suspect that they have been excavated by material ejected into space by impacts on the surface of Mars. The grooves thus formed as crater chains, and all of them fade away as the trailing apex of Phobos is approached. They have been grouped into 12 or more families of varying age, presumably representing at least 12 Martian impact events. Nonetheless, in November 2018, astronomers concluded that the many grooves on Phobos were caused by boulders, ejected from the asteroid impact that created Stickney crater, that rolled around on the surface of the moon. Faint dust rings produced by Phobos and Deimos have long been predicted but attempts to observe these rings have, to date, failed. Recent images from Mars Global Surveyor indicate that Phobos is covered with a layer of fine-grained regolith at least 100 meters thick; it is hypothesized to have been created by impacts from other bodies, but it is not known how the material stuck to an object with almost no gravity. The unique Kaidun meteorite that fell on a Soviet military base in Yemen in 1980 has been hypothesized to be a piece of Phobos, but this has been difficult to verify because little is known about the exact composition of Phobos. A person who weighs 68 kg (150 lb) on Earth would weigh about 60 g (2 oz) standing on the surface of Phobos. Geological features on Phobos are named after astronomers who studied Phobos and people and places from Jonathan Swift's Gulliver's Travels. A number of craters have been named, and are listed in the following table. Left: The impact crater Stickney imaged by the Mars Reconnaissance Orbiter in March 2008. The second impact crater inside Stickney is Limtoc. Right: Labeled Map of Phobos – Moon of Mars (U.S. Geological Survey). There is one named regio, Laputa Regio, and one named planitia, Lagado Planitia; both are named after places in Gulliver's Travels (the fictional Laputa, a flying island, and Lagado, imaginary capital of the fictional nation Balnibarbi). The only named ridge on Phobos is Kepler Dorsum, named after the astronomer Johannes Kepler. Orbits of Phobos and Deimos. Phobos makes about four orbits for every one made by Deimos. The orbital motion of Phobos has been intensively studied, making it "the best studied natural satellite in the Solar System" in terms of orbits completed. Its close orbit around Mars produces some unusual effects. With an altitude of 5,989 km (3,721 mi), Phobos orbits Mars below the synchronous orbit radius, meaning that it moves around Mars faster than Mars itself rotates. Therefore, from the point of view of an observer on the surface of Mars, it rises in the west, moves comparatively rapidly across the sky (in 4 h 15 min or less) and sets in the east, approximately twice each Martian day (every 11 h 6 min). Because it is close to the surface and in an equatorial orbit, it cannot be seen above the horizon from latitudes greater than 70.4°. Its orbit is so low that its angular diameter, as seen by an observer on Mars, varies visibly with its position in the sky. Seen at the horizon, Phobos is about 0.14° wide; at zenith it is 0.20°, one-third as wide as the full Moon as seen from Earth. By comparison, the Sun has an apparent size of about 0.35° in the Martian sky. Phobos's phases, inasmuch as they can be observed from Mars, take 0.3191 days (Phobos's synodic period) to run their course, a mere 13 seconds longer than Phobos's sidereal period. As seen from Phobos, Mars would appear 6,400 times larger and 2,500 times brighter than the full Moon appears from Earth, taking up a quarter of the width of a celestial hemisphere. The Mars–Phobos Lagrangian L1 is 2.5 kilometers (1.6 mi) above Stickney, which is unusually close to the surface. Annular eclipse of the Sun by Phobos as viewed by the Mars Curiosity rover (20 August 2013). An observer situated on the Martian surface, in a position to observe Phobos, would see regular transits of Phobos across the Sun. Several of these transits have been photographed by the Mars Rover Opportunity. During the transits, Phobos's shadow is cast on the surface of Mars; an event which has been photographed by several spacecraft. Phobos is not large enough to cover the Sun's disk, and so cannot cause a total eclipse. Tidal deceleration is gradually decreasing the orbital radius of Phobos by 2 meters every one hundred years. Scientists estimate that Phobos will be destroyed in approximately 30–50 million years, with one study's estimate being about 43 million years. Phobos' grooves were long thought to be fractures caused by the impact that formed the Stickney crater. Other modelling suggested since the 1970s support the idea that the grooves are more like "stretch marks" that occur when Phobos gets deformed by tidal forces, but in 2015 when the tidal forces were calculated and used in a new model, the stresses were too weak to fracture a solid moon of that size, unless Phobos is a rubble pile surrounded by a layer of powdery regolith about 100 m (330 ft) thick. 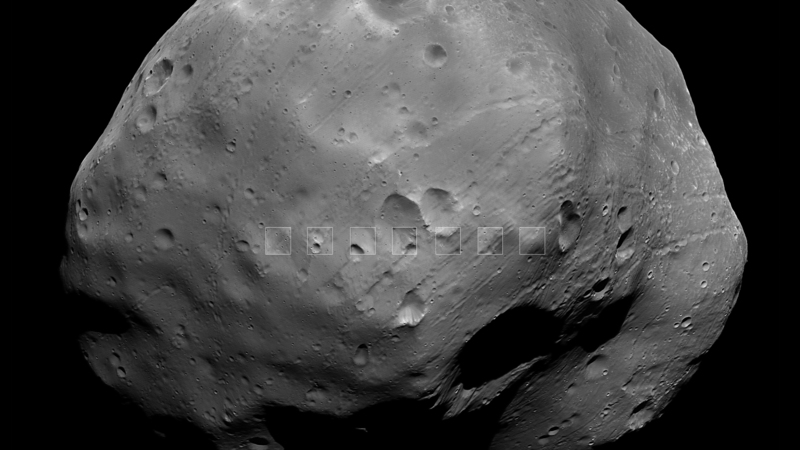 Stress fractures calculated for this model line up with the grooves on Phobos. The model is supported with the discovery that some of the grooves are younger than others, implying that the process that produces the grooves is ongoing. Given Phobos's irregular shape and assuming that it is a pile of rubble (specifically a Mohr–Coulomb body), it will eventually break up when it reaches approximately 2.1 Mars radii. When Phobos is eventually torn apart by tidal forces, a fraction of the debris will likely form a planetary ring around Mars, which may last from one million to one hundred million years. Video (01:30/real-time): Eclipse of the Sun by Phobos, larger of the two moons of Mars (Curiosity Rover, 20 August 2013). The origin of the Martian moons is still controversial. Phobos and Deimos both have much in common with carbonaceous C-type asteroids, with spectra, albedo, and density very similar to those of C- or D-type asteroids. Based on their similarity, one hypothesis is that both moons may be captured main-belt asteroids. Both moons have very circular orbits which lie almost exactly in Mars's equatorial plane, and hence a capture origin requires a mechanism for circularizing the initially highly eccentric orbit, and adjusting its inclination into the equatorial plane, most probably by a combination of atmospheric drag and tidal forces, although it is not clear that sufficient time is available for this to occur for Deimos. Capture also requires dissipation of energy. The current Martian atmosphere is too thin to capture a Phobos-sized object by atmospheric braking. Geoffrey A. Landis has pointed out that the capture could have occurred if the original body was a binary asteroid that separated under tidal forces. Curiosity's view of the Mars moons: Phobos passing in front of Deimos – in real-time (video-gif, 1 August 2013). Phobos could be a second-generation Solar System object that coalesced in orbit after Mars formed, rather than forming concurrently out of the same birth cloud as Mars. Another hypothesis is that Mars was once surrounded by many Phobos- and Deimos-sized bodies, perhaps ejected into orbit around it by a collision with a large planetesimal. The high porosity of the interior of Phobos (based on the density of 1.88 g/cm3, voids are estimated to comprise 25 to 35 percent of Phobos's volume) is inconsistent with an asteroidal origin. Observations of Phobos in the thermal infrared suggest a composition containing mainly phyllosilicates, which are well known from the surface of Mars. The spectra are distinct from those of all classes of chondrite meteorites, again pointing away from an asteroidal origin. Both sets of findings support an origin of Phobos from material ejected by an impact on Mars that reaccreted in Martian orbit, similar to the prevailing theory for the origin of Earth's moon. In the late 1950s and 1960s, the unusual orbital characteristics of Phobos led to speculations that it might be hollow. Globe of Phobos at the Memorial Museum of Astronautics in Moscow (19 May 2012). Subsequently, the systemic data errors that Singer predicted were found to exist, and the claim was called into doubt, and accurate measurements of the orbit available by 1969 showed that the discrepancy did not exist. Singer's critique was justified when earlier studies were discovered to have used an overestimated value of 5 cm/yr for the rate of altitude loss, which was later revised to 1.8 cm/yr. The secular acceleration is now attributed to tidal effects,  which had not been considered in the earlier studies. The density of Phobos has now been directly measured by spacecraft to be 1.887 g/cm3. Current observations are consistent with Phobos being a rubble pile. In addition, images obtained by the Viking probes in the 1970s clearly showed a natural object, not an artificial one. Nevertheless, mapping by the Mars Express probe and subsequent volume calculations do suggest the presence of voids and indicate that it is not a solid chunk of rock but a porous body. The porosity of Phobos was calculated to be 30% ± 5%, or a quarter to a third being empty. Phobos imaged by Spirit rover (first two images) and by Mars Express (last image) in 2005. Phobos has been photographed in close-up by several spacecraft whose primary mission has been to photograph Mars. The first was Mariner 7 in 1969, followed by Viking 1 in 1977, Mars Global Surveyor in 1998 and 2003, Mars Express in 2004, 2008, and 2010, and Mars Reconnaissance Orbiter in 2007 and 2008. On 25 August 2005, the Spirit rover, with an excess of energy due to wind blowing dust off of its solar panels, took several short-exposure photographs of the night sky from the surface of Mars. Phobos and Deimos are both clearly visible in the photograph. The Soviet Union undertook the Phobos program with two probes, both launched successfully in July 1988. Phobos 1 was accidentally shut down by an erroneous command from ground control issued in September 1988 and lost while the craft was still en route. 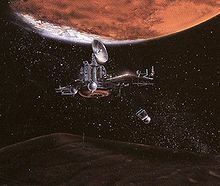 Phobos 2 arrived at the Mars system in January 1989 and, after transmitting a small amount of data and imagery but shortly before beginning its detailed examination of Phobos's surface, the probe abruptly ceased transmission due either to failure of the on-board computer or of the radio transmitter, already operating on the backup power. Other Mars missions collected more data, but the next dedicated mission attempt would be a sample return mission. The Russian Space Agency launched a sample return mission to Phobos in November 2011, called Fobos-Grunt. The return capsule also included a life science experiment of The Planetary Society, called Living Interplanetary Flight Experiment, or LIFE. A second contributor to this mission was the China National Space Administration, which supplied a surveying satellite called "Yinghuo-1", which would have been released in the orbit of Mars, and a soil-grinding and sieving system for the scientific payload of the Phobos lander. However, after achieving Earth orbit, the Fobos–Grunt probe failed to initiate subsequent burns that would have sent it off to Mars. Attempts to recover the probe were unsuccessful and it crashed back to Earth in January 2012. In 1997 and 1998, the Aladdin mission was selected as a finalist in the NASA Discovery Program. The plan was to visit both Phobos and Deimos, and launch projectiles at the satellites. The probe would collect the ejecta as it performed a slow flyby (~1 km/s). These samples would be returned to Earth for study three years later. The Principal Investigator was Dr. Carle Pieters of Brown University. The total mission cost, including launch vehicle and operations was $247.7 million. Ultimately, the mission chosen to fly was MESSENGER, a probe to Mercury. In 2007, the European aerospace subsidiary EADS Astrium was reported to have been developing a mission to Phobos as a technology demonstrator. Astrium was involved in developing a European Space Agency plan for a sample return mission to Mars, as part of the ESA's Aurora programme, and sending a mission to Phobos with its low gravity was seen as a good opportunity for testing and proving the technologies required for an eventual sample return mission to Mars. The mission was envisioned to start in 2016, was to last for three years. The company planned to use a "mothership", which would be propelled by an ion engine, releasing a lander to the surface of Phobos. The lander would perform some tests and experiments, gather samples in a capsule, then return to the mothership and head back to Earth where the samples would be jettisoned for recovery on the surface. The Phobos monolith (right of center) as taken by the Mars Global Surveyor (MOC Image 55103, 1998). In 2007, the Canadian Space Agency funded a study by Optech and the Mars Institute for an unmanned mission to Phobos known as Phobos Reconnaissance and International Mars Exploration (PRIME). A proposed landing site for the PRIME spacecraft is at the "Phobos monolith", a prominent object near Stickney crater. The PRIME mission would be composed of an orbiter and lander, and each would carry 4 instruments designed to study various aspects of Phobos's geology. In 2008, NASA Glenn Research Center began studying a Phobos and Deimos sample return mission that would use solar electric propulsion. The study gave rise to the "Hall" mission concept, a New Frontiers-class mission under further study as of 2010. Another concept of a sample return mission from Phobos and Deimos is OSIRIS-REx II, which would use heritage technology from the first OSIRIS-REx mission. As of January 2013, a new Phobos Surveyor mission is currently under development by a collaboration of Stanford University, NASA's Jet Propulsion Laboratory, and the Massachusetts Institute of Technology. The mission is currently in the testing phases, and the team at Stanford plans to launch the mission between 2023 and 2033. 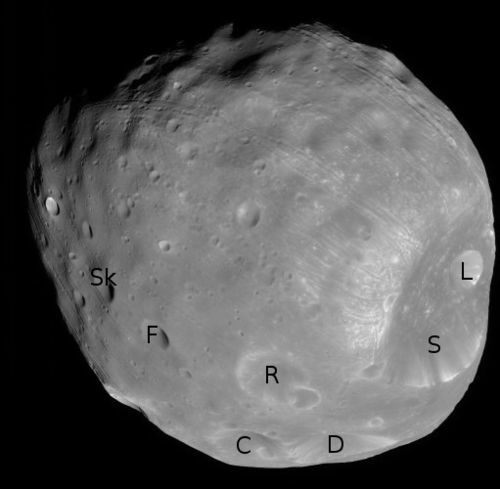 In March 2014, a Discovery class mission was proposed to place an orbiter in Mars orbit by 2021 to study Phobos and Deimos through a series of close flybys. The mission is called Phobos And Deimos & Mars Environment (PADME). Two other Phobos missions that were proposed for the Discovery 13 selection included a mission called Merlin, which would flyby Deimos but actually orbit and land on Phobos, and another one is Pandora which would orbit both Deimos and Phobos. The Japanese Aerospace Exploration Agency (JAXA) unveiled in 9 June 2015 the Martian Moons Exploration (MMX), a sample return mission targeting Phobos. MMX will land and collect samples from Phobos multiple times, along with conducting Deimos flyby observations and monitoring Mars's climate. By using a corer sampling mechanism, the spacecraft aims to retrieve a minimum 10 g amount of samples. NASA, ESA, and CNES are also participating in the project, and will provide scientific instruments. The U.S. will contribute the Neutron and Gamma-Ray Spectrometer (NGRS), and France the Near IR Spectrometer (NIRS4/MacrOmega). Although the mission has been selected for implementation and is now beyond proposal stage, formal project approval by JAXA has been postponed following the Hitomi mishap. Development and testing of key components, including the sampler, is currently ongoing. As of 2017, MMX is scheduled to be launched in 2024, and will return to Earth five years later. Russia plans to repeat Fobos-Grunt mission in the late 2020s, and the European Space Agency is assessing a sample-return mission for 2024 called Phootprint. Phobos has been proposed as an early target for a human mission to Mars. The teleoperation of robotic scouts on Mars by humans on Phobos could be conducted without significant time delay, and planetary protection concerns in early Mars exploration might be addressed by such an approach. The human exploration of Phobos could serve as a catalyst for the human exploration of Mars and be scientifically valuable in its own right. Most recently, it was proposed that the sands of Phobos could serve as a valuable material for aerobraking in the colonization of Mars. Because the small delta-v budget of Phobos, a small amount of chemical fuel brought from Earth could be transformed in a very large amount of sand lifted from the surface of Phobos -from a permanent outpost, to a transfer orbit. This sand could be released in front of the spacecraft during the descent maneuver and then resulting in a densification of the atmosphere just in front of the spacecraft. ^ a b c d e f g h i j k l m "Mars: Moons: Phobos". NASA Solar System Exploration. 30 September 2003. Archived from the original on 19 October 2013. Retrieved 2 December 2013. ^ a b "Planetary Satellite Physical Parameters". JPL (Solar System Dynamics). 13 July 2006. Retrieved 29 January 2008. ^ "Phobos | Definition of Phobos in English by Oxford Dictionaries". ^ "Mar's moon Phobos". NASA. NASA. Retrieved 16 July 2016. ^ a b "NASA – Phobos". Solarsystem.nasa.gov. Archived from the original on 24 June 2014. Retrieved 4 August 2014. ^ a b Gough, Evan (20 November 2018). "Strange Grooves on Phobos Were Caused by Boulders Rolling Around on its Surface". Universe Today. Retrieved 21 November 2018. ^ a b Ramsley, Kenneth R.; Head, James W. (16 November 2018). "Origin of Phobos grooves: Testing the Stickney Crater ejecta model". Planetary and Space Science. 165: 137–147. doi:10.1016/j.pss.2018.11.004. ^ a b c d "Phobos is Slowly Falling Apart". NASA. SpaceRef. 10 November 2015. Retrieved 2015-11-11. ^ "Notes: The Satellites of Mars". The Observatory. 1 (6): 181–185. 20 September 1877. Bibcode:1877Obs.....1..181. Retrieved 4 February 2009. ^ Hall, Asaph (17 October 1877). "Observations of the Satellites of Mars". Astronomische Nachrichten (Signed 21 September 1877). 91 (2161): 11/12–13/14. Bibcode:1877AN.....91...11H. doi:10.1002/asna.18780910103. ^ Madan, Henry George (4 October 1877). "Letters to the Editor: The Satellites of Mars". Nature (Signed 29 September 1877). 16 (414): 475. Bibcode:1877Natur..16R.475M. doi:10.1038/016475b0. ^ Hall, Asaph (14 March 1878). "Names of the Satellites of Mars". Astronomische Nachrichten (Signed 7 February 1878). 92 (2187): 47–48. Bibcode:1878AN.....92...47H. doi:10.1002/asna.18780920304. ^ "Solar System Exploration: Planets: Mars: Moons: Phobos: Overview". Solarsystem.nasa.gov. Archived from the original on 24 June 2014. Retrieved 19 August 2013. ^ a b "Close Inspection for Phobos". It is light, with a density less than twice that of water, and orbits just 5,989 kilometers (3,721 mi) above the Martian surface. ^ Busch, Michael W.; Ostro, Steven J.; Benner, Lance A. M.; Giorgini, Jon D.; et al. (2007). "Arecibo Radar Observations of Phobos and Deimos". Icarus. 186 (2): 581–584. Bibcode:2007Icar..186..581B. doi:10.1016/j.icarus.2006.11.003. ^ Murchie, Scott L.; Erard, Stephane; Langevin, Yves; Britt, Daniel T.; et al. (1991). "Disk-resolved Spectral Reflectance Properties of Phobos from 0.3–3.2 microns: Preliminary Integrated Results from PhobosH 2". Abstracts of the Lunar and Planetary Science Conference. 22: 943. Bibcode:1991pggp.rept..249M. ^ Rivkin, Andrew S.; Brown, Robert H.; Trilling, David E.; Bell III, James F.; et al. (March 2002). "Near-Infrared Spectrophotometry of Phobos and Deimos". Icarus. 156 (1): 64–75. Bibcode:2002Icar..156...64R. doi:10.1006/icar.2001.6767. ^ Fanale, Fraser P.; Salvail, James R. (1989). "Loss of water from Phobos". Geophys. Res. Lett. 16 (4): 287–290. Bibcode:1989GeoRL..16..287F. doi:10.1029/GL016i004p00287. ^ Fanale, Fraser P.; Salvail, James R. (Dec 1990). "Evolution of the water regime of Phobos". Icarus. 88 (2): 380–395. Bibcode:1990Icar...88..380F. doi:10.1016/0019-1035(90)90089-R.
^ "Stickney Crater-Phobos". One of the most striking features of Phobos, aside from its irregular shape, is its giant crater Stickney. Because Phobos is only 28 by 20 kilometers (17 by 12 mi), it must have been nearly shattered from the force of the impact that caused the giant crater. Grooves that extend across the surface from Stickney appear to be surface fractures caused by the impact. ^ Murray, John B.; Murray, John B.; Iliffe, Jonathan C.; Muller, Jan-Peter A. L.; et al. "New Evidence on the Origin of Phobos' Parallel Grooves from HRSC Mars Express" (PDF). 37th Annual Lunar and Planetary Science Conference, March 2006. ^ Showalter, Mark R.; Hamilton, Douglas P.; Nicholson, Philip D. (2006). "A Deep Search for Martian Dust Rings and Inner Moons Using the Hubble Space Telescope" (PDF). Planetary and Space Science. 54 (9–10): 844–854. Bibcode:2006P&SS...54..844S. doi:10.1016/j.pss.2006.05.009. ^ Britt, Robert Roy (13 March 2001). "Forgotten Moons: Phobos and Deimos Eat Mars' Dust". space.com. Retrieved 12 May 2010. ^ Ivanov, Andrei V. (March 2004). "Is the Kaidun Meteorite a Sample from Phobos?". Solar System Research. 38 (2): 97–107. Bibcode:2004SoSyR..38...97I. doi:10.1023/B:SOLS.0000022821.22821.84. ^ Ivanov, Andrei; Zolensky, Michael (2003). "The Kaidun Meteorite: Where Did It Come From?" (PDF). Lunar and Planetary Science. 34. The currently available data on the lithologic composition of the Kaidun meteorite– primarily the composition of the main portion of the meteorite, corresponding to CR2 carbonaceous chondrites and the presence of clasts of deeply differentiated rock – provide weighty support for considering the meteorite’s parent body to be a carbonaceous chondrite satellite of a large differentiated planet. The only possible candidates in the modern Solar System are Phobos and Deimos, the moons of Mars. ^ "Phobos: Facts About the Doomed Martian Moon". Retrieved 2016-07-17. ^ USGS Staff. "Phobos Map – Shaded Relief" (PDF). USGS. Retrieved 18 August 2013. ^ a b Bills, Bruce G.; Neumann, Gregory A.; Smith, David E.; Zuber, Maria T. (2005). "Improved estimate of tidal dissipation within Mars from MOLA observations of the shadow of Phobos" (PDF). Journal of Geophysical Research. 110 (E07004): E07004. Bibcode:2005JGRE..110.7004B. doi:10.1029/2004je002376. ^ Efroimsky, Michael; Lainey, Valéry (2007). "Physics of bodily tides in terrestrial planets and the appropriate scales of dynamical evolution". Journal of Geophysical Research. 112 (E12): E12003. arXiv:0709.1995. Bibcode:2007JGRE..11212003E. doi:10.1029/2007JE002908. ^ "Phobos is Slowly Falling Apart—SpaceRef". spaceref.com. Retrieved 17 July 2016. ^ "Mars' moon Phobos is slowly falling apart". www.sciencedaily.com. Retrieved 17 July 2016. ^ Holsapple, Keith A. (December 2001). "Equilibrium Configurations of Solid Cohesionless Bodies". Icarus. 154 (2): 432–448. Bibcode:2001Icar..154..432H. doi:10.1006/icar.2001.6683. ^ Sample, Ian (23 November 2015). "Gravity will rip Martian moon apart to form dust and rubble ring". the Guardian. Retrieved 17 July 2016. ^ "New Views of Martian Moons". ^ "Close Inspection for Phobos". One idea is that Phobos and Deimos, Mars's other moon, are captured asteroids. ^ Cazenave, Anny; Dobrovolskis, Anthony R.; Lago, Bernard (1980). "Orbital history of the Martian satellites with inferences on their origin". Icarus. 44 (3): 730–744. Bibcode:1980Icar...44..730C. doi:10.1016/0019-1035(80)90140-2. ^ Pätzold, Martin & Witasse, Olivier (4 March 2010). "Phobos Flyby Success". ESA. Retrieved 4 March 2010. ^ a b Andert, Thomas P.; Rosenblatt, Pascal; Pätzold, Martin; Häusler, Bernd; et al. (7 May 2010). "Precise mass determination and the nature of Phobos". Geophysical Research Letters. 37 (9): L09202. Bibcode:2010GeoRL..37.9202A. doi:10.1029/2009GL041829. ^ Giuranna, Marco; Roush, Ted L.; Duxbury, Thomas; Hogan, Robert C.; et al. (2010). "Compositional Interpretation of PFS/MEx and TES/MGS Thermal Infrared Spectra of Phobos" (PDF). European Planetary Science Congress Abstracts, Vol. 5. Retrieved 1 October 2010. ^ "Mars Moon Phobos Likely Forged by Catastrophic Blast". Space.com. 27 September 2010. Retrieved 1 October 2010. ^ Öpik, Ernst Julius (September 1964). "Is Phobos Artificial?". Irish Astronomical Journal. 6: 281–283. Bibcode:1964IrAJ....6..281. ^ Öpik, Ernst Julius (March 1963). "News and Comments: Phobos, Nature of Acceleration". Irish Astronomical Journal. 6: 40. Bibcode:1963IrAJ....6R..40. ^ Efroimsky, Michael; Lainey, Valéry (29 December 2007). "Physics of bodily tides in terrestrial planets and the appropriate scales of dynamical evolution". Journal of Geophysical Research—Planets, Vol. 112, p. E12003. doi:10.1029/2007JE002908. ^ a b "Mars Express closes in on the origin of Mars' larger moon". DLR. 16 October 2008. Retrieved 16 October 2008. ^ "Closest Phobos flyby gathers data". BBC News. London. 4 March 2010. Retrieved 7 March 2010. ^ "Two Moons Passing in the Night". NASA. Retrieved 27 June 2011. ^ "Projects LIFE Experiment: Phobos". The Planetary Society. Retrieved 12 May 2010. ^ "Russia, China Could Sign Moon Exploration Pact in 2006". RIA Novosti. 11 September 2006. Retrieved 12 May 2010. ^ "HK triumphs with out of this world invention". Hong Kong Trader. 1 May 2007. Retrieved 12 May 2010. ^ "PolyU-made space tool sets for Mars again". Hong Kong Polytechnic University. 2 April 2007. Retrieved 23 January 2018. ^ "S86-25375 (1986)". Spaceflight.nasa.gov. Retrieved 4 August 2014. ^ Pieters, Carle. "Aladdin: Phobos -Deimos Sample Return" (PDF). 28th Annual Lunar and Planetary Science Conference. 28th Annual Lunar and Planetary Science Conference. Retrieved 28 March 2013. ^ "Five Discovery mission proposals selected for feasiblilty studies". Retrieved 28 March 2013. ^ PRIME: Phobos Reconnaissance & International Mars Exploration Archived 24 July 2007 at the Wayback Machine, Mars Institute website, accessed 27 July 2009. ^ Mullen, Leslie (30 April 2009). "New Missions Target Mars Moon Phobos". Astrobiology Magazine. Space.com. Retrieved 5 September 2009. ^ Lee, Pascal; Veverka, Joseph F.; Bellerose, Julie; Boucher, Marc; et al. ; 2010; "Hall: A Phobos and Deimos Sample Return Mission", 44th Lunar Planetary Science Conference, The Woodlands, TX. 1–5 Mar 2010. [#1633] Bibcode: 2010LPI....41.1633L Check bibcode: length (help). ^ a b Pandika, Melissa (28 December 2012). "Stanford researchers develop acrobatic space rovers to explore moons and asteroids". Stanford Report. Stanford, CA. Stanford News Service. Retrieved 3 January 2013. ^ Lee, Pascal; Bicay, Michael; Colapre, Anthony; Elphic, Richard (17–21 March 2014). Phobos And Deimos & Mars Environment (PADME): A LADEE-Derived Mission to Explore Mars's Moons and the Martian Orbital Environment (PDF). 45th Lunar and Planetary Science Conference (2014). ^ Reyes, Tim (1 October 2014). "Making the Case for a Mission to the Martian Moon Phobos". Universe Today. Retrieved 5 October 2014. ^ Lee, Pascal; Benna, Mehdi; Britt, Daniel T.; Colaprete, Anthony (16–20 March 2015). PADME (Phobos And Deimos & Mars Environment): A Proposed NASA Discovery Mission to Investigate the Two Moons of Mars (PDF). 46th Lunar and Planetary Science Conference (2015). ^ "JAXA plans probe to bring back samples from moons of Mars". The Japan Times Online. 10 June 2015. ^ a b c Fujimoto, Masaki (11 January 2017). "JAXA's exploration of the two moons of Mars, with sample return from Phobos" (PDF). Lunar and Planetary Institute. Retrieved 23 March 2017. ^ "Coopération spatiale entre la France et le Japon Rencontre à Paris entre le CNES et la JAXA-ISAS" (PDF) (Press release) (in French). CNES. 10 February 2017. Retrieved 23 March 2017. ^ "ISASニュース 2017.1 No.430" (PDF) (in Japanese). Institute of Space and Astronautical Science. 22 January 2017. Retrieved 23 March 2016. ^ Green, James (7 June 2016). "Planetary Science Division Status Report" (PDF). Lunar and Planetary Institute. Retrieved 23 March 2017. ^ "A Study of Near-Infrared Hyperspectral Imaging of Martian Moons by NIRS4/MACROMEGA onboard MMX Spacecraft" (PDF). Lunar and Planetary Institute. 23 March 2017. Retrieved 23 March 2017. ^ "Observation plan for Martian meteors by Mars-orbiting MMX spacecraft" (PowerPoint). 10 June 2016. Retrieved 23 March 2017. ^ "A giant impact: Solving the mystery of how Mars' moons formed". ScienceDaily. 4 July 2016. Retrieved 23 March 2017. ^ Tsuneta, Saku (10 June 2016). "JAXA Space Science Program and International Cooperation". Retrieved 23 March 2017. ^ "ISASニュース 2016.7 No.424" (PDF) (in Japanese). Institute of Space and Astronautical Science. 22 July 2016. Retrieved 23 March 2017. ^ Barraclough, Simon; Ratcliffe, Andrew; Buchwald, Robert; Scheer, Heloise; Chapuy, Marc; Garland, Martin (16 June 2014). Phootprint: A European Phobos Sample Return Mission (PDF). 11th International Planetary Probe Workshop. Airbus Defense and Space. ^ Koschny, Detlef; Svedhem, Håkan; Rebuffat, Denis (2 August 2014). "Phootprint – A Phobos sample return mission study". ESA. 40: B0.4–9–14. Bibcode:2014cosp...40E1592K. 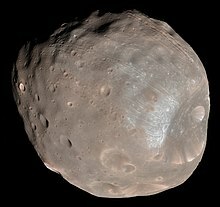 ^ "Martian moon Phobos hip-deep in powder". Jpl.nasa.gov. 11 September 1998. Retrieved 4 May 2014. ^ "Discover – June 2009". Discover.coverleaf.com. 29 April 2009. Retrieved 4 May 2014. ^ Arias, Francisco. J; De Las Heras, Salvador. A (2018). "Sandbraking. A technique for landing large payloads on Mars using the sands of Phobos". Aerospace Science and Technology. 85: 409–415. doi:10.1016/j.ast.2018.11.041. ISSN 1270-9638.